Elena “Babydoll” Reid returns to the boxing ring June 12th. She will take on Russian Anastaia Toktaulova at the Mohegan Sun in Connecticut. You can catch the fight live on FOX Sports. Look for Elena to have her second MMA fight later this summer. Xtreme Couture’s Elena “Babydoll” Reid steps back into the boxing ring February 28th in New York City’s famed Roseland Ballroom. One of the all time classic venues, Roseland has been played by a young Frank Sinatra, The Rolling Stones and Madonna. Elena will be putting her WIBA Flyweight (112lbs) belt on the line when she faces Eileen Olszewski. PS: How cool is that poster. 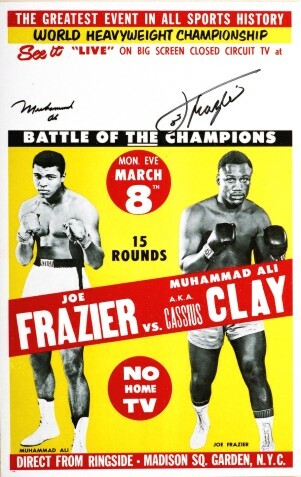 We’re big time fans of old fight posters like this one and this one. The above poster combines the old fight poster with Commie propaganda posters like this one. 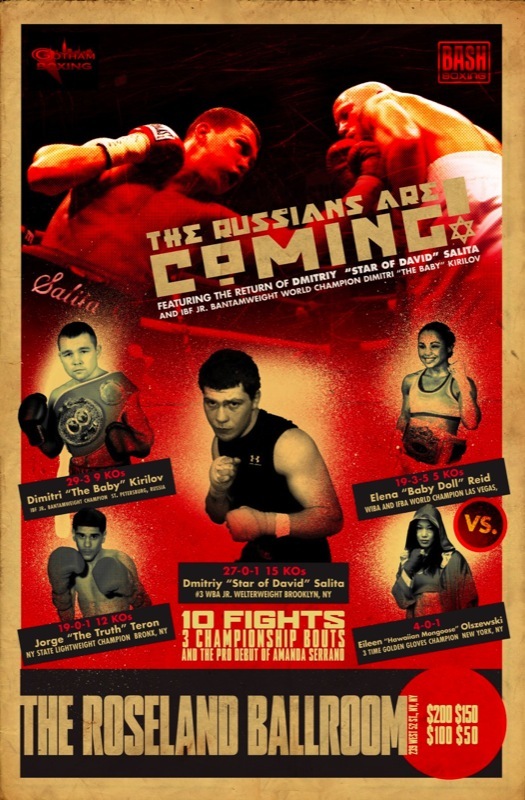 The Russians are our pals now, but its still a cool idea for a poster. The IFO/Steele Cage event tonight is streaming FREE on the web. Log on to http://ibnsports.com/ to see Elena “Baby Doll” Reid make her MMA debut and Dennis “The Piranha” Davis continue his quest for the IFO 145-lb title. Esteemed boxing writer David Avila did a profile piece on Elena “Baby Doll” Reid for MSNBC.com. Check it out here. Elena makes her MMA debut against Tammie Schneider Friday night for Steele Cage at the Riviera (fights start at 7pm, Elena should hit the ring around 9). It promises to be a great fight. Joe Stevenson, Gray, Sam Stout and Chris Ben put Elena through her final week of workouts. They’ll all be at the fights cheering her and Dennis Davis on. Luckily we don’t have a rodent problem at the gym. So no mice were stirring. But lots of fighters were. While kids on the East Coast were heading to bed with visions of sugar plums and Xbox 360’s dancing in their heads, Pro Practice was in full swing. Jay Hieron hit pads as Shawn Tompkins held them. Chris and Jay leave for Connecticut at 7:30am the day after Christmas. Where Jay takes on Delson Heleno for the Welterweight belt and Chris is scheduled to fight Ryan Schulz for the Lightweight strap. Chris has had 4 scheduled opponents in the past 4 weeks. Jay worked on his wrestling with Gray “The Bully” Maynard. Gray is gearing up for Dennis Sivers at The Ultimate Fight Night on January 23rd. Joe “Daddy” Stevenson broke camp in Big Bear to have Christmas in Vegas. But he didn’t miss anytime in the gym. Joe takes on BJ Penn for the UFC Lightweight Championship January 19th in Newcastle, England where incidentally they have lots of coals. Hopefully not in children’s stockings. Elena “Baby Doll” Reid is making final preparations for her MMA debut Friday night at the Riviera for the IFO. Tickets are still available. If you’re coming into town for the UFC on Saturday swing up to the Riviera for a night of great fights at a reasonable price. Call 702.794.9333 and use code Steele 375 for a discount. 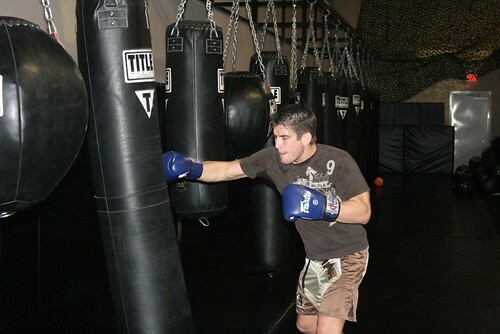 Sam Stout worked the heavy bag while waiting for his turn with Tompkins. The man called “Hands of Stone” returns to the Octagon January 19th on the same card as Joe Daddy. Xtreme Couture’s Elena “Baby Doll” Reid is set to make her MMA debut in the IFO December 28th at the Riviera. Elena has had a distinguished career as a pro boxer including headlining a card on FOX Sports earlier this Fall. Elena holds a record of 19 wins against 3 losses and 5 draws as a boxer. She is the WIBA and IFBA Flyweight champion. We had a chance to sit down with her today after Pro Practice. Elena: The visibility of the sport and I want to be more active as a fighter. In the U.S. right now it seems the sport and business of MMA is more accepting of women than boxing. My whole life I have trained to be a front runner as a woman in the fight business and it just seems to fit. XC: What do you think of MMA so far? Elena: I love it. I feel like a kid in a candy store. It’s a lot of fun. The only thing I dislike about it is that I started as a kick boxer and got really bruised. In boxing I don’t get bruised. But now in MMA I come out everyday covered in black and blue and I’m always sore. But I like that I feel like a kid again where I’m learning and don’t know what to expect. But I make up for it with aggression and toughness. XC: Will you defend boxing titles during your MMA career? Elena: I would love to, yes. 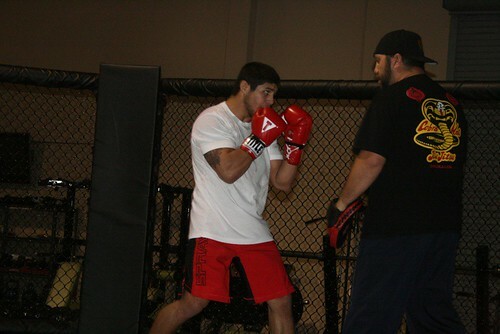 The hope for everything is that my MMA career increases my visibility and that that will help my boxing. I would like to have belts in both boxing and MMA at the same time. XC: Is it diffictult to compete in both sports at the same time? Elena: The training is, yes. Because MMA is a whole day event for me. In boxing I could train after school or work. But MMA is a full time job for me now. Elena: Because it’s the best. No question about it. If you want to be the best you have to train with the best. XC: When did you start fighting? Elena: When I was 15. XC: Why did you start? Elena: I played sports growing up and have always been competitive. I had a friend who was in kickboxing. I did it and fell in love with the competition. It made me give up everything else. It fit me because it has everything. You have to be in shape, run, do strength and conditioning and learn technique. In anything that I do chose to do I want to be the best and will always put all my heart and soul into it. To do whatever is in my control to make things happen. Elena: I’m hopeful and really thankful to the Xtreme Couture team for being accepting of me. As a female you never know if people will be accepting of you as a fighter. I’ve earned respect here and I’m very thankful for that. I know as a female it doesn’t always end up that way. Tickets to Elena’s debut are available at the Riviera Box Office by calling 702.794.9433. Use code “Steele 256” for discount tickets.